Started in the year 1999, Sriram Foams Private Limited has excelled in making all types of polyurethane products including flexible, Integral skin, rigid and castable elastomers. Our organization is managed by our Founder and Managing Director Mr. P. Muthukumar who possess wide industrial knowledge and proficient in his tasks. It is under his tutelage that our foam techniques have been developed and our production process have been planned in such a way that we have captured a wide market share in the domain we operate. In today's modern times, people are giving more emphasis on the finish, style, and elegance especially when it comes to interior and decor products. Similarly when it comes to seating, comfortable seating is becoming the order of the day. Various companies are emerging in market every now and then with their cushion and foam products. We, at Sriram Foams understand the desires and requirements of modern customers and fulfill their requirements by manufacturing cushions and foam products which are comfortable and durable. Our company has established itself as a leading manufacturer and exporter offering the best cushion products at an affordable price range. Over the years, our matchless foam products which come in many designs at cost effective rates have placed us at the pinnacle of this business domain. We offer supreme range of foam products in a finish that matches with the best in the world. 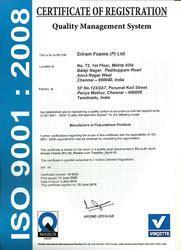 The company for its steadfast commitment on quality and best manufacturing practices was credited with ISO 9001:2008 certificate from VINCOTTE. Sriram is among the very few companies in the industry to receive the covetous NSIC-ONICRA performance and credit-rating. We are looking for Export Enquiries from Europe and Russia. Manufacturing, Trading, Importer and Exporter of Polyurethane Products. Owing to our wide experience in this field we have also excelled in moulded foam making, Elastomers, Rigid panels, Integral skin, Press tool Components etc., based with Polyurethane foaming applications. All our products are used for making various designer furniture which complement the interiors of the decor as well as for making of various automobile bodies. Each and every product which passes out of the manufacturing unit is carefully scrutinized by them so that they are not subject to rejection at a later stage due to any defect in the raw material or production. Sriram Foams was established with a mission to be the leading manufacturer and supplier of foam products and synonym of trust, values, quality, and ethical practices. 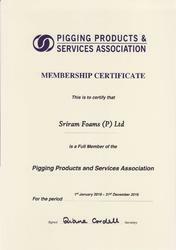 We, at Sriram Foams are sincerely making all endeavors to manufacture a comprehensive range of foam products like Hi-density Moulded Flexible PU Foams, Visco Elastic (Memory foam), Rigid PU Foams, Elastomers, all kinds of Pipe Cleaning Pigs including Hi, Low and medium density foam pig, Cleaning Pigs, Batching Pigs, Gauging Pigs, Bi-Directional Pigs, PU Cups and Discs, and all pig accessories etc. complying with international quality norms. Our mission is to be at the best choice for customers by providing quality products and best value for money. We are continuously striving to offer maximum satisfaction to all our customers. Our company enjoys a dominant position in the domestic as well as International markets. Timely execution of orders of quality products has enabled us to maintain long term relations with our clients and setting milestones for our company. We are also praised because of our timely deliveries aiming at customers satisfaction. We have gained their appreciation and respect through our high quality standards, innovative products, ethical business practices along with a competitive price structure. We are heading a team of technical supervisors, product experts, designing specialists and engineers who are highly proficient in their respective operational fields and are also well acquainted with the polyurethane technology. They also undergo various training sessions at regular intervals to keep themselves updated with new ideas and techniques. Our team of research technicians indulge into rigorous research work before coming up with the final solution. We also possess a team of personnels who are expert in maintaining the logistics and keeping a record of the same.